Nagyesztergár (German: Großestergart) is located between the cities of Zirc and Mór approximately 5kms from Zirc. Already in Roman times, the area was populated. During the Árpád reign, royal servants lived here. King Sigismund gave the region to the Ányos family in 1401 who owned it until the 19th century. Ányos Pál (1756-1784), an important poet of Hungarian sentimentalism, was born in Nagyesztergár. The organised settlement of Nagyesztergár in the mid-18th century marked a new period in the regions’ history. The settlement was arduous since the territory was full of woods, shrubs and mountains. Ferenc Ányos oragnised the settlement without financial securities. Unlike the landowners around him, he had no previous experience in the administration of property and no expert support. Ferenc Ánoys tried to attract inner-Hungarian migrants – settlers that were already within Hungary but looking for a new place to settle. As an incentive, he promised the settlers in 1751 to construct 20 farmhouses, to finance the forest clearance, two years of tax freedom and the free right to move. In 1750, apart from Ányos’ wooden house only a few huts inhabited by charburners and a ranger could be found. The first settlers came to Nagyesztergár in 1748. During the 1760s, ten years after Ánoys had promised the favourable conditions, 40 more families are recorded. Eight years later, 46 bondmen, 29 cottager and 7 lodgers are mentioned. 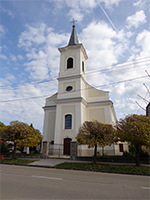 Jakob Fellner, famous architect of the Esterházy family, designed the late-baroque church of Saint John of Nepomuk. The image of Mary on the altar is from the 18th century and one wall of the church displays the names of the victims of both World Wars. Every year, the whole of the villages celebrates a parish fair on Saint Nepomuk’s day. 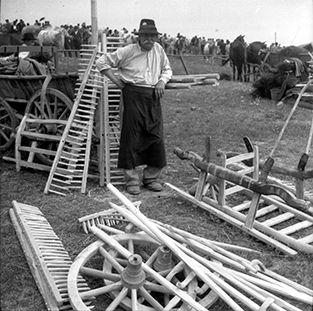 Maker of wooden tools in Nagyesztergár in the 1970s. LEFT: The church was designed by Jakob Fellner and built in the late 18th century. 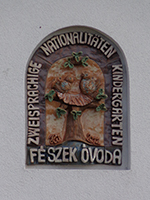 RIGHT: The children of Nagyesztergár are brought up bilingually.